New Mexico currently has a unique process for dealing with "estrayed" horses. First, let's clarify what an estray horse is. Basically, any horse found roaming without an immediately identifiable owner is "estrayed" by the New Mexico Livestock Board (NMLB, a state agency) per NMSA Section 77-13-4. Once the stray is in the custody of the NMLB, a Notice is posted on the NMLB website under "Found Livestock Notices". This Notice is active for 5 days only, and serves as the official notification to the owner. If the owner of the horse does not step forward during this time frame, on the 6th day the horse is auctioned off through a bidding system. This system is a sealed bid process, with bids submitted to the NMLB. There is no recourse if your bid is not the highest, no option for raising a bid when a higher bid has been entered by another entity. Essentially, each bidder gets one chance to own the horse. The ramifications of this bidding process are often fatal to the horse. 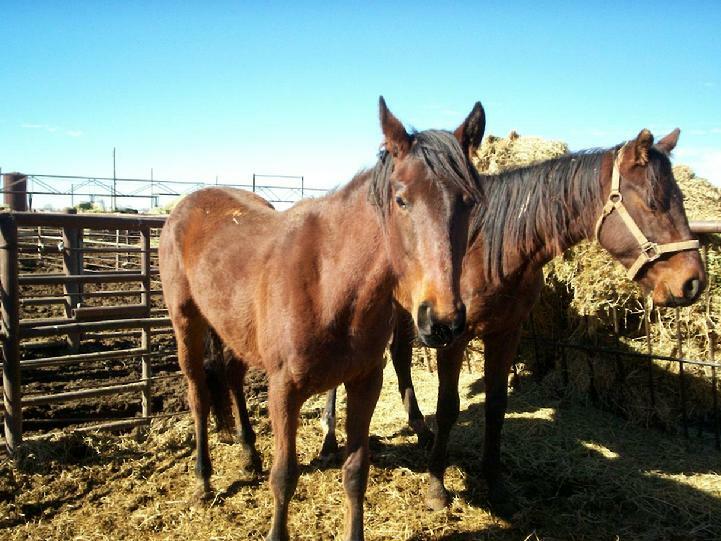 Prior to 2013, the horse rescues in New Mexico worked with the NMLB by providing a safe haven for these estray horses during the 5 day holding period. Sometimes, these strays require medical care and of course a special diet during this period. These costs were absorbed by the rescue and subsequently the NMLB would title the horse to the rescue for the costs incurred. *Disclaimer - the rescues are NOT set up to take in wild/feral horses, although sometimes do. Where does this bidding process leave estray horses? Often in a truck headed for slaughter. Horse rescues would like to provide a safety net for these horses, but the cost of outbidding the kill buyer can amount to over $500. And even then there is no guarantee that the rescue will be the high bidder. Rescues are now forced into buying a horse at a exaggerated price to save it from slaughter - sometimes even going so far as to purchase the horse from the kill buyer at a greatly inflated price after losing the bid. Adding to that, there is no way to know if a private individual submitting a bid would be a good home. So, rescues are forced to outbid good homes just to outbid the kill buyer. There is no other option available. This system is not in the best interest of the horse, the rescue, or the private citizen. To help horse rescues pay these disproportionate ransoms, a fund has been created called the New Mexico Estray Equine Fund (NMEEF). The purpose of this fund is to provide the rescues with the needed money to bid high enough to outbid the kill buyers. The NMEEF will essentially hold monies donated until a rescue draws out funds to pay for a horse that rescue has bid on and won. This Fund is operated as an affiliate program of Four Corners Equine Rescue, thereby insuring all donations are tax deductible and traceable. For the rescues, whose purpose it is to rehabilitate and rehome the horses - usually to the tune of a couple thousand dollars per horse - being forced to pay hundreds of dollars to purchase a horse from the state is incongruous and unnecessary. It only serves to take away funds from the rescues that would be better spent rehabilitating horses and finding them homes. However, this is the system under which we are forced to operate in our efforts to help the horses. While the rescues continue to try to change this system, the power is ultimately held by New Mexico State Government. Until this system can be changed, please donate to the NMEEF. on top of that rescues are required to pay for microchipping, EIA tests, and the boarding fees incurred by NMLB during the 5 day holding period ($10/day).